Armed Forces - Active Outdoors Pursuits Ltd. Active provide a range of Adventurous Training opportunities for the armed forces & military personnel. Our training ranges from activity days to skills development NGB courses as well as 4 & 5 Month fast track instructor training courses suitable for those looking to train for a new career. We recognise the different requirements for this type of training and will be glad to talk to you about your training requirements to ensure you get the best training solution. Throughout our lives we repeatedly find ourselves in teams. It may be at work, at school or on the sports field; we have all experienced the challenges and thrill of working with other people towards a common goal. Taking time to reflect on the team experience through experiential adventure provides tangible and immediate results for individual and team growth. Active provide four distinctive types of event tailored for team development, however these events can be modified and tailored to suit you exact needs. Adventure Challenge – Single day event based around an orienteering course using map reading skills to find your way through a course, en route facing problem solving tasks! Shipwrecked – A treasure hunt to find your way back after being marooned on an desert island! Lost! – A Day event where your team will be tested physically and mentally to get themselves to safety after getting lost in the hills. X Adventure – Competitive team event involving orienteering, problem solving tasks, canoeing, cycling, walking, rock climbing and abseiling. We use the challenge of the outdoor environment and a series of strategic challenges to focus on problem solving, team work, brain storming, building self confidence, strategy development, decision making, reviewing skills, resolving conflict, establishing trust, etc. Builds valuable skills for your teams’ success! These courses are both physically and mentally challenging and can be pitched at the level you require to achieve your needs. These events can be facilitated throughout Scotland in any remote or challenging country. 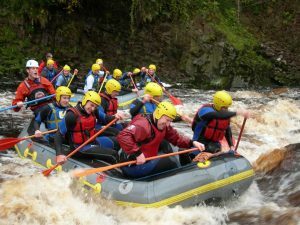 Activity days are hugely popular throughout the year and provide a great day out working as a team as well as having a fun challenging element to them. Day activities include White Water Rafting, Canyoning, Rock Climbing, Mountain Scrambling and Mountain Biking. Please get in touch if you would like a bespoke quote for your regiment.